Special articles from Dr. Ong's monumental scientific astronomical research into Chinese astrology and Feng Shui. Gui Management Centre is making available preliminary findings of our highly scientific research into Chinese astrology and Feng Shui, backed up by intensive analysis of the ancient texts. 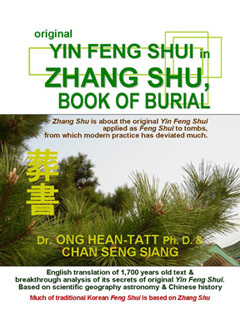 GUI Management Centre research has uncovered hereto not understood significant Feng Shui meanings in Zhang Shu, Book of Burial, a fundamental text for Feng Shui applications. Previous commentators had not really understood Zhang Shu, Book of Burial. The internal evidence of the text also indicates that Zhang Shu, Book of Burial, referred to the geographical landform of Luoyang, the ancient capital. There are also significant reference to Zi Wei Dou Shu astrology! The new understanding of Zhang Shu was made possible through comparison with other ancient Feng Shui texts, especially of Tian Yu Jing, Heaven Jade Classic . Zhang Shu, was written by Guo Po during the Jin dynasty, circa AD 250. This ancient text is considered a fundamental text for Feng Shui. The term "Book of Burial" would seem to say it is a text meant for Yin premises, like tombs. Yet, despite its title as "Book of Burial", the principles of Zhang Shu are widely applied to Form Luan Tou Feng Shui of Yang premises. Yes, the riddle is why a book ostentatiously labeled as for "burial" is used for premises of the living! Guo Po had written Zhang Shu close after the end of the Han dynasty. The timing was significant. It has to do with something which occurred to the custom of burial during the Han dynasty. 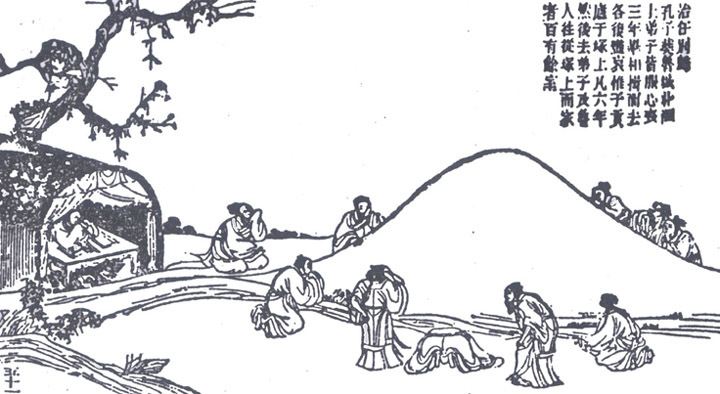 Legend of founding Han emperor Kao Tsu (High Progenitor) looking for his parents' grave. This legend is connected with origin of placing Hell money papers with stones on top on the tomb during the Qing Ming festival. After winning the battles to become the founding Han emperor Kao Tsu, Kao Tsu went back to the area where his parents were buried. He wanted to establish his parents in a proper tomb for honours. But, the area had become a wilderness and he was at wits end as to where his parents were buried. Desperately he asked the gods for a sign. He would throw a bunch of coloured papers into the air. The wind was blowing strongly in the area and blowing the papers into the air. Kao Tsu prayed that should a paper fall onto a grave and remain unmoved by the wind that would be his parents' grave. Sure enough, there was one piece of paper on the ground which could not be blown away by the wind. On examination, he recognised that it was his parents' grave. Ever since then, during Qing Ming, people imitated the custom of placing Hell money papers on tombs, with stones on top of the papers. The incidence related above contains clues as to what really occurred with respect to the tombs of Kao Tsu's parents and that of Confucius. What modern people do not realise is the nature of the mourning ritual associated with the dead during the period before Kao Tsu. Confucius spelt out in his Li Chi, Book of Rites, that mourning periods for the dead could last a few years according to the relationships to the dead. During these mourning periods, observations were done at the tombs themselves. But once the mourning period was over, the tombs were abandoned. After the mourning periods, no one bothered anymore with the tombs and their remains. The tombs were left neglected and forgotten. The tombs were unmarked and within a few years their locations would be lost under the weeds and shrubs which would grow over them. There was no disrespect to the dead. This was because once the mourning period was over, an ancestral tablet was made to be transferred to the clan ancestral temple. The dead would be remembered along with sacrifices in the ancestral temple. At the time before Kao Tsu the people did not undertaken ancestral memorials at the tombs but at the temples. It was Han Kao Tsu who brought a radical change to the way the dead would be remembered. Initially, Kao Tsu adopted the traditional Confucian ritual and thus abandoned his parents' tomb after the customary mourning period. The parents' ancestral tablet was likely properly taken to the ancestral temple. But Kao Tsu now wanted a more conspicuous memorial to his parents. Hence, his pretext of returning to the area to look for his parents' tomb. Actually he just could not locate them anymore. He thus cooked up a ruse to claim someone's else grave as that of his parents! Whatever bones collected to his parents' new memorial shrine were likely those of other people. Kao Tsu was to set a new precedent. He had unwittingly created the new custom of marking the tomb in order to continue carrying out ancestral memorial services at the tombs. Previously, people did this at the ancestral temples. With Kao Tsu, the ancestral services were extended to tombs and tombs took a new meaning in the Chinese society. The shift of memorial services for the dead from ancestral temples to the tombs can also be taken as a adverse Feng Shui factor which doomed future dynasties! Future dynasties were to find it hard to match the long durations of the previous Hsia-Shang-Chou dynasties, which lasted respectively 500, 700 and 1,000 years. In contrast, the Han and future dynasties could not last beyond 400 years. Red guards opened up Confucius' tomb and found nothing in it! Nobody knew why the tomb was empty. The above is also the solution to the riddle of the empty tomb of Confucius. It was also Kao Tsu who initiated the custom of imperial homage to the tomb of Confucius. Since then all emperors either visited the tomb of Confucius in homage or they sent representatives. There were constant gifts and honours from the emperors to Confucius and his family. The Kung family received more and more land. Confucius' tomb was said to be located within a good Feng Shui site. Qin emperor Shi Huang Di attempted to destroy the Feng Shui of Confucius' tomb by causing a river to flow across the cemetery. But that action unwittingly improved the Feng Shui of the site. Hence, the glory of Confucius and his family down the generations could be attributed to good Feng Shui of the tomb. Only, during the Cultural Revolution communist Red guards were on a rampage against anything religious. They were mutilating and destroying religious artefacts all over China. They arrived at the cemetery of the Kung family. The tomb of the latest patriarch was opened and the corpse hung from the limb of a tree. The Red guards then proceeded to Confucius' tomb and broke it open. To their surprise they found the tomb empty! The director of the Confucius memorial committee in Qu Fu confessed they do not know why the tomb was empty. The answer lies in that during Confucius' time, nobody paid attention to a tomb once the mounring period was over. The records indicate that Confucius' students remained at the tomb for 6 years and then abandoned the tomb. The customary mourning over, the students returned to their homes. Hence, in time, no one later really knew where Confucius was actually buried. When Han Kao Tsu wanted to pay homage to Confucius, the family of Confucius knew well that the grave of their illustrious founder was long gone and no one knew where it was. But to Kao Tsu this was no real problem. An empty tomb would do as well. Thus, at that long forgotten beginning, no one was fooled. Everybody at that time accepted the symbolic burial tomb as the proper place to pay homage to Confucius. 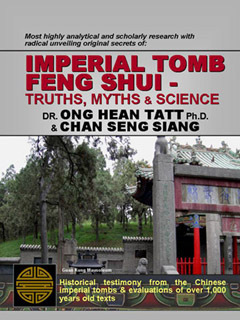 Tombs began to assume greater roles for ancestral services with Han Kao Tsu. As tombs now were more frequently visited than before, it was necessary that tomb sites also possessed similar good Feng Shui as seen in the ancestral temples. Previously, no one bothered about Feng Shui of tombs as no one then gave prolonged attention to them. Now, how were people going to ensure good Feng Shui for tombs? That is, the traditional extant Feng Shui practised for ancestral temples had to be adopted and modified for tombs! That was what Guo Po did. Guo Po gathered the known Feng Shui principles practised for ancestral temples. He then showed how these principles should be applied for tombs. The ancestral services were always carried out for the dead since the dawn of the Chinese civilisation. During the Shang and Chou dynasties such ancestral services were undertaken at the ancestral temples. Only the rulers and certain high born had ancestral temples built over their tombs. But tombs never received widespread ancestral services until the arrival of Han Kao Tsu. 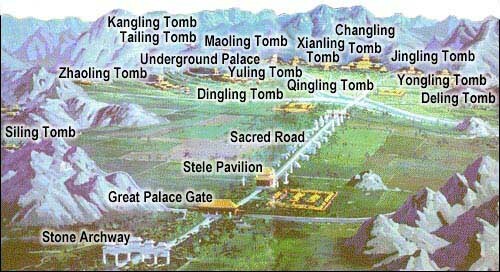 Zhang Shu was therefore a sort of guideline to people as to how to prepare the Feng Shui of tombs. The principles were borrowed from the ancestral temples and also from Feng Shui applied to palaces and Yang premises. The Feng Shui applied to tombs was thus no real different from that applied to Yang living premises and ancestral temples. All those so-called differences between "Yin Feng Shui" and "Yang Feng Shui" are all nonsense. A lot of nonsense has been spinned about Feng Shui of tombs. It is time you find out what are the real original Feng Shui applied to tombs. Guo Po stressed the starting guideline that there is a real physical cause and effect relationship between Feng Shui of the site and how blessings confer on the descendants. The text then embarks into the twofold methodology of the famous maxim "Xuen Lung, Zhei Xian", Find the Dragon, Establish the Terminus. First, Zhang Shu explains the rules of looking at the mountain ranges. Then, second, Zhang Shu explains the necessary features of the hsueh. The internal evidence shows significant reference to the physical geography of Luoyang, one of the ancient capitals of China. Fleetingly, here and there in and especially at the end of the text, Guo Po referred to time aspects which he did not elaborated upon in Zhang Shu. These time aspects were later explained in greater details by Yang Yun Sung in his Tian Yu Jing, Heaven Jade Classics. They contains powerful secrets related to kingship and involve lost secrets of Zi Wei Dou Shu. Read startling highlights of our findings on Zi Wei Dou Shu, including how the emperor faked the current Zi Wei Dou Shu! This translation and critical analysis is part of Gui Management Centre's mammoth project translating ancient Mandarin texts on Feng Shui and astrology into English. These are especially analysed in terms of history and scientific geography and astronomy, for both Feng Shui and astrology are highly scientific. Contact us and enroll in our courses for radical fresh insights into the real original majestic meanings of Feng Shui and astrology! Learn imperial level Feng Shui and astrology far more superior than current roadside fortune telling. Certain parts of the research may not find publications but would be taught to deserving students, especially to how integrated Feng Shui and astrology relate to kingship secrets used to be applied by emperors. All our efforts are dedicated to Confucius, the first to write down Feng Shui and astrology information. Gui Management Centre is making available preliminary findings of our highly scientific research into Chinese astrology and Feng Shui, backed up by intensive analysis of the ancient texts. Many findings are new and may disturb current views, but practitioners should be proactive to advance further. Those who are interested to know more can purchase our translation and commentary of the Zhang Shu at the ebook site. ONCE KNOWN TO THE ANCIENT CIVILISATIONS!